The Manual of Horsemanship is a complete basic guide to horsemanship and horse care, suitable for all ages and containing an amalgam of expert knowledge. Boasting numerous improved, updated features and enjoying its biggest overhaul in a decade, the manual has been comprehensively revised with an exciting new format and design. 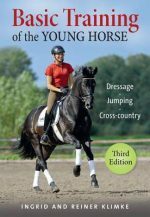 This new edition has been brought up to date by members of the Training Committee of The Pony Club to include major updates to the Bridle, Bitting and Additional Saddlery, Shoeing and Worm Control chapters. With The Training Scale now included, along with an addition of an extensive glossary of terms, the chapters within the book have been re-arranged and grouped into three themed sections Part One: The Horse, Part Two: The Rider and Riding and Part Three: Saddlery and Lorinery, which makes reading the manual more logical. New photographs, charts and diagrams feature throughout and the increase in page size to 270 x 200mm provides ease of reference.